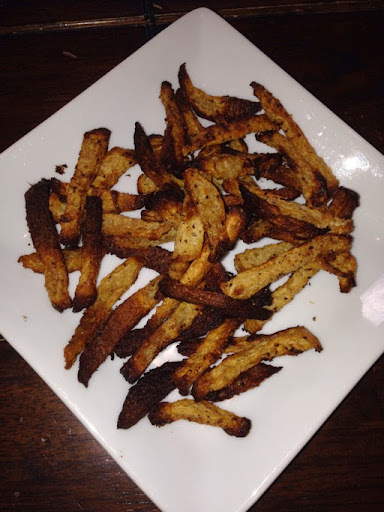 I just made the most delicious "fries" for a fraction of the calories and fat and a boat load more nutrients. All you need is a jicama, some cooking spray and your favorite veggie seasoning (or just some salt and pepper). Never heard of jicama? Well let me introduce you. First of all, the "j" is pronounced as an "h"...just a warning so you don't look like an idiot when raving about your "new fries" (you're welcome!). Jicama is a root vegetable that is full of fiber and vitamin c and lacks calories and fat (yeah!). You can find it an any grocery store in the produce isle. You can eat an entire small jicama worth of fries for 140 calories, 32 carbs, 18 grams fiber (what?!) and 3 grams of protein. Run a 5K to celebrate spring! This winter has been particularly harsh but now it's time to get outside and shed those hibernation pounds. If you are ready to take your walk up to a run, there is no better motivation than to sign yourself up for your very first 5K race and then of course train for it. And right now is the perfect time to start your training...there are like a million races since race season is just starting! All you need is about 10 weeks to train, a great pair of running shoes and some can-do attitude. Check with your doctor to see if running is right for you if you have any medical condition or injury...better to be safe than sorry. Get a great pair of running shoes. As avid KC runner Elizabeth says, “Seems to me that anyone can run any distance if they find a reasonable training plan and stick to it. It also seems to me that a lot of beginning runners are picking the wrong shoes - that is, buying according to looks/price - and then they get hurt and quit. I'd recommend starting out at a specialty store and having them analyze your gait. You may drop a few more dollars than you would have otherwise, but you won't feel it quite as much the morning after!” I recommend checking out Gary Gribbles, Smart Feet, Elite Feet or any other running specialty store to get the perfect shoes for you! Set a realistic schedule. The plan calls for 4 days of training a week. Put your days and times that you will run on your calendar and treat those times as untouchable times…like you would a meeting at work, your graduation ceremony, happy hour with your favorite people. You get the picture…write it/type it and then stick to it. Also, if you’re not a morning person, do not plan on training in the morning at 5 a.m…that is a recipe for disaster. Instead, train over lunch or right after work. Remember, this is YOUR training. If you can already run for a 2 minutes at a time, by all means, start at Week 5 and go from there. If you are struggling to make it past a week, stick with that particular workout until you have mastered it before going on. It’s about you and your success. It doesn’t matter how long you take to get there… it’s your attitude and perseverance. Justin, a long time KC runner says this about running: “Running is 90 percent mental - if you think you can do it, you will do it.” If you fall behind, no worries…keep at it and you will reach your goal! Week 1: Walk 30 minutes. Week 2: Alternate walking 2 minutes with running 30 seconds for a total of 20 minutes. Week 3: Alternate walking 1.5 minutes with running 30 seconds for 24 minutes total. Week 4: Walk 1.5 minutes, run 1 minute for 25 minutes. Week 5: Run 1.5 minutes, walk 1 minute; run 3 minutes, walk 1.5 minutes for 28 minutes total. Week 6: Run 5 minutes, walk 3 minutes for a total of 30 minutes. Week 7: Run 6 minutes, walk 2 minutes for a total of 32 minutes. Week 8: Run 20 minutes. Week 9: Run 25 minutes. Week 10: Run 30 minutes the first two days and 32 minutes the last day. For upcoming races in your area, click here. Get the best night sleep possible...you'll be glad you did! So what can a person do if they have problems falling asleep or staying asleep like some 50 to 70 million Americans do? Incorporating a few simple changes into your life (especially around bed time) can make a big difference in how easily you fall asleep and stay asleep. Click here for some simple sleeping tips. I hope you love this workout as much as I have…whew! This is the deal: do each exercise 32 times before moving on to the next, then do each exercise 16 times, then 8. You’ll basically be cutting your reps in half each time. To make it harder, don’t take breaks between exercises or sets. To make it a bit less challenging, take a 10-20 second breather between. It should take you about 20-30 minutes to complete. Make sure to stretch afterwards!